The goal of this blog post is to help you set up a cluster for serious testing or production use. If all you want to do is kick the tires a bit with Kubernetes, minikube is a better option. It runs on your machine and incurs no cloud costs. We will stand up the GKE environment using Terraform. This lets us manage its lifetime and create a new identcial one if needed. It also means that if disaster has struck, we do not need to hunt down the only person in the organization who knows how to deploy a full environment. Terraform encodes that knowledge. It will have a single multi-purpose pool of nodes. If we need specialized ones later, we can add another node pool and set a Kubernetes Taint as appropriate. The node pool should be managed entirely by GKE. This means it gets automatic upgrades of Kubernetes versions and automatic node repairs (or replacement). The node pool should also have auto-scaling enabled, because we are not able to forecast how large it needs to be. And we do not want to turn customers away due to lack of resources, right? This guide really is from scratch, and so, we do not even assume that you have an account at Google Cloud! If you do, then please jump to the next section. Get your credit card ready and head over to Google Cloud. Hit the “Get started for free” button. 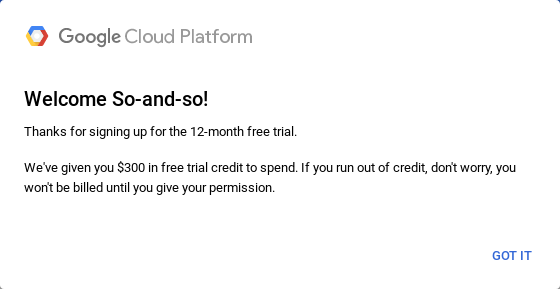 While you get $300 of free credits, Google still needs a credit card to verify that you are not just some spam bot looking to score some free cloud resources. They won’t start charging you without telling you about it first, though. Choose whether you want a business account or an individual one. With that taken care of, we can start to create a project! Terraform cannot help us set up this, so we will have to do this part manually using the Google Cloud console. The reason is that Terraform needs to work within the context of a project. So first create folders as appropriate for your organization’s needs, and then create a project. After hitting the button, you can access the Overview. It will tell you to create some credentials, and that is just what we will do. Finally, in the last step, the most important part is to create a key and downloading it in JSON format. Don’t miss this step! Save it to wherever you cloned the repo accompanying this blog post. Call it account.json, because that is what the Terraform files expect. It will not be committed to version control, so don’t worry. Also, keep it safe! Whoever has access to the key will be able to act as the Service Account. If you should lose it, disable the key immediately from the IAM Admin console. Not only do we want Terraform to use our Service Account, we want it to store its Remote State on Google Storage. This means that several team members can access the state. Because Terraform state is stored in the cloud, we can still manage our infrastructure even if the computer used for deploying it would go missing or similar. This will open a new browser window, asking you to log in. Do so, and answer all the questions in the terminal. Afterwards, you are ready to use the Google Cloud SDK. If your output looks similar (apart from the bucket ID), you are good to go! We will set up a Terraform Workspace for each of our deployments. Remember that there could be a reason for us to deploy several replicas of this environment (staging, disaster recovery, etc.). Let’s define one called “production”. There is a file in the accompanying repo called production.tfvars, which you can inspect, modify, and use. Most values in the Terraform files have been written such that you just need to modify the production.tfvars file. However, one hard-coded value is in google.tf, on the line where the bucket is specified. The reason for this unfortunate limitation is technical: Terraform does not allow variables in that particular section. So change it in your google.tf file and then proceed. Created and switched to workspace "production"! Terraform gives us a lot of output, but among others, it will say that the “google” provider has been configured and that the “gcs” (remote state backend) provider has been set up. Success! When you create a GKE cluster, you automatically wind up with an initial node pool. While that sounds nice, the problem is that we cannot manage it and set the configuration we want (auto-upgrades, auto-repair, and auto-scaling). So we will ask Terraform to create a cluster, then delete the initial node pool. It will then be asked to create a new node pool (that has the configuration options set), and then attach it to the cluster. This is so common (and the recommended approach) that Terraform has a special option for it. In this post, we showed how to deploy an auto-repairing, auto-updating, auto-scaling cluster from scratch on Google Container Engine (GKE) using Terraform. The setup made use of a custom Service Account for security, and used Terraform Workspaces to make multi-cluster management possible. When your Kubernetes journey brings you to the point where a fully-managed and compliant Kubernetes cluster makes sense, don’t hesitate to contact us at Elastisys.